Part of my day job is to watch news wires from sports media outlets around the world to find the most interesting and important stories as soon as they’re published. And so I had something of a front-row seat on Friday evening when, at around the same time the Cleveland Cavaliers and Denver Nuggets were tipping off in a nationally-televised NBA game, it was being revealed that Cleveland guard Dion Waiters had cited his Islamic faith as the reason why he didn’t stand with his team during the traditional pre-game playing of “The Star-Spangled Banner” earlier in the week in Utah. Waiters said he is rededicating himself to Islam, and according to the author of the article, the third-year pro out of Syracuse University “appears to be in a happier state” despite losing his spot in the starting lineup with the arrivals of LeBron Janes and Shawn Marion this summer. Due to the timing of the original story’s release, it’s likely that most of the live crowd in Denver didn’t see it by the time they settled into their seats at the Pepsi Center on Friday. If they had, I assume Waiters would’ve been booed each time he touched the ball. And when Waiters was on the receiving end of a flagrant foul by Nuggets forward Darrell Arthur in the first half and took a scary fall to the hardwood, I would’ve guessed a segment of the crowd might cheer Waiters’ misfortune and applaud Arthur acting as a de facto defender of America. But the crowd’s general lack of reaction to Waiters, even as he scored a season-high 17 points and helped the Cavs hand the home team a 110-101 defeat, was probably an indication that the story hadn’t yet spread inside the arena. Or perhaps the Nuggets fan base was actually accepting of Waiters because they were confronted with a similar form of expression from one of their own years ago. Back in 1996, Nuggets point guard Mahmoud Abdul-Rauf became the center of a national controversy when it was revealed that he hadn’t been standing for the national anthem due to his beliefs as a Muslim. Abdul-Rauf’s action sparked a heated national debate and he was even suspended by the NBA for one game before deciding that he would compromise and stand for the anthem while praying to Allah (SWT). But Abdul-Rauf’s time in the spotlight came at a time when the U.S. wasn’t as openly hostile to Muslims as it is today. In 1996, your average American’s closest tie to Islam might have been the memory of Malcolm X, or the Nation of Islam, or universally beloved boxing legend Muhammad Ali. Abdul-Rauf was subject to plenty of negative backlash when he committed an act that many view as disrespectful to America, but it could have been worse. In the post-9/11 era, when Islamophobia is at an all-time high and Western media outlets consistently fail to present a fair and balanced view of Muslims — and in an era in which social media and online anonymity has become the new pointed hood of ignorant and hateful individuals — Waiters could face a public response that is much worse than what Abdul-Rauf experienced. 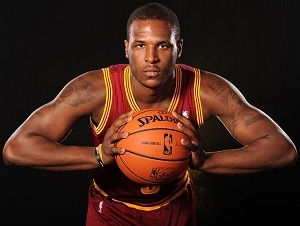 For reasons unknown right now, however, Waiters did stand with his team for the national anthem on Friday. It’s possible he knew the story about his earlier refusal to stand would be coming out and he decided to do what he could to lighten a potentially volatile situation. Or perhaps he consulted with a Muslim adviser or took a lesson from Abdul-Rauf’s story. Or maybe he just changed his mind. It will be interesting to see how this story develops, and how Waiters is greeted on Monday when the Cavs return home to face the New Orleans Pelicans. The team’s next road game is Friday, Nov. 14, against the Boston Celtics. UPDATE: On Saturday, Nov. 8, Dion Waiters posted on Twitter that “whoever made that up about me & the national anthem is a (expletive) lie,” among other denials. Later that evening, Northeast Ohio Media Group reporter Chris Haynes said he’d spoken again to Waiters, and that the two realized there had been a miscommunication regarding Waiters’ reported plans to continue skipping the national anthem. On Sunday, Waiters told reporters after a Cavs practice that he was doing his “normal routine” in the locker room and simply lost track of time when he missed the playing of the national anthem. Waiters clarified that his routine does not involve praying, saying “it has nothing to do with religion.” He did allow, however, that he might have mentioned religion to Haynes on Friday when he was first asked about why he missed the anthem. It seems all we know now is that Dion Waiters is Muslim, masha’Allah, and that his missing the pre-game playing of the national anthem one time was not him taking a stand based on Islamic principles. May Allah grant brother Dion peace and clarity during this time. It is a difficult decision to make, however I think in such a society, one’s freedom to stand or not stand for a national anthem should not warrant abuse from either side.